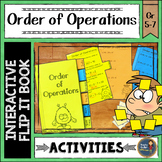 This zip file includes a 7 slide PowerPoint and a math interactive notebook page about the order of operations. 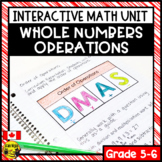 The PowerPoint can be used to help the students fill in the interactive math notebook. Use this printable to have your students glue into their notebooks and color! I have my students color the P one color, E a different color, MD a third color, and AS a fourth color. You can print as is or print two to a page. You can also print large and use as a poster. Enjoy! 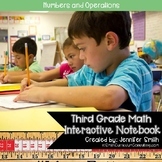 This product includes a foldable for your math interactive notebook. 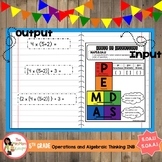 It also contains a practice sheet and task cards with QR Codes for checking answers. Answer sheet also included. Your purchase comes with the document to create the foldable pictured above. 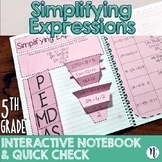 The set of notebook pages are fun for students and easy to use with any interactive notebook. 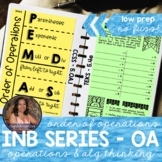 The pages all full size and in PDF format, so if your using a smaller notebook you can print two per page and have them fit. Download contains 5 pages in Adobe Acrobat (.pdf) format. (1) Cover document. 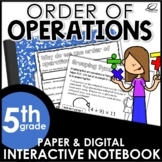 (2) Order of Operations foldable for Interactive Notebooks. 7th grade - Common Core Alignment. (2) Entry and Exit Ticket with 3 challenging expressions. Print and go!